SAN RAMON, CA — JANUARY 14, 2015 — FunMobility, a leading innovator in mobile engagement technology and services, today unveiled a new, full-service program enabling retailers to enhance in-store shopper marketing materials with mobile engagement. “You can walk into any store in the world, and you’ll see the same thing: shoppers are using their phones to help with purchasing decisions. We wanted to give retailers & shopper marketing agencies a low-barrier, quick-turnaround way to own a piece of that in-store mobile attention,” said Pat Murphy, Vice President of Mobile Relationship Management. 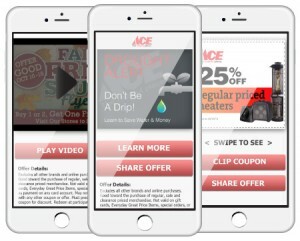 Ace Hardware dealers, early adopters of the Smart Shopper program, have already seen tremendous results using monthly mobile content that combines coupons & product promotions with shopper-support content like how-to videos & money-saving household tips. In late 2014, the retailer’s mobile coupon CTR was 36%, with a redemption rate 10x that of their print offering. “FunMobility truly helped us reach our business goals,” said Linda Roark, voted Ace Hardware’s 2014 Dealer of the Year. featuring household tips, how-to videos, & mobile coupons. “There’s obviously a lot that shopper marketers can do with printed media, but at the end of the day it’s still just a piece of paper. We’re taking that piece of paper and making it interactive, giving in-store shoppers immediate access to information & incentives—but in a way that the retailer still controls,” said Adam Lavine, FunMobility CEO and the founding chair of the Mobile Coupon Standards Committee. Pricing is totally scalable, starting at $99 per location, per month. FunMobility combines patented tech with expert services to deliver branded mobile engagement at every consumer touchpoint. Their managed services include media buys & hands-on campaign optimization, fully-transparent reporting around custom KPIs, expert creative & technical execution, and post-campaign retention & CRM. Established in 1999, FunMobility is privately held and headquartered in San Ramon, California. More information is available at www.funmobility.com. For Sales inquiries, please call toll-free (855) 849-4900 or email sales@funmobility.com.